Blessed with this book in exchange for an honest opinion. If you’re gonna run for your life, you gotta wear the right shoes. Riley Mae Hart loves sports and action - so when the Swift-river Shoe Company offers her a contract to be the spokesperson for their new outdoor sport collection, she jumps at the chance. Soon she’s appearing in commercials and magazine ads, and every girl in town wants to wear Riley Mae shoes. Well, except for Riley. Because walking in those shoes means missing out on softball season, making her best friend TJ mad, and embarrassing her new friend, Rusty. It also means sneaking around, hiding, and keeping secrets - because suddenly something isn’t quite right at Swift-river. But a contract’s a contract, so Riley laces up her “Rock Shocker” hiking boots for a climb up Half-Dome in Yosemite. Will they be the right shoes to get her back on solid ground? Jill Osborne works in children's ministry and has a passion for telling great stories. 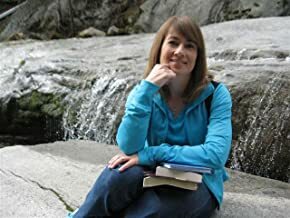 She has written plays and skits for youth group and Sunday morning drama teams, curriculum for children's ministry, countless articles for Church newsletters, and a blog about taking a Sabatical in a motor home. Good News Shoes is her first series for kids. She plans to run with it. I was privileged to receive this book from Book Look in exchanged for an unbiased review. And blessed to have Katie, a young tween girl, to review it for me. I think this is one of the best books I have ever read! There is so much adventure it just kept me up all night. Riley Mae gets offered a cool job. She gets to be a spokesperson for a sports collection. There are many exciting things that happen including a climb up Half-Dome in Yosemite, and some shocking false identities. My mind kept begging me for one more chapter. I was so sad when I was finished with the book. Thank you Katie, for guest posting on my blog! I always enjoy reading your opinions.